Thu, 07/09/2006 – 16:08Andreas Jaeger is pleased to announce the availability of openSUSE 10.2 (codename:Basilisk Lizard) Alpha4. With this new release are a number of significant changes. The kernel in this release is 2.6.18rc5 and an SMP one by default. The GNOME version has been bumped up to 2.15.92 and KDE now uses the new kickstart menu.For a full list of changes and download links, view the official release announcement from the mailing list.Remember that any bugs which may be encountered should now be reported against “openSUSE 10.2”. Any branding which may be found as “SUSE Linux 10.1” should be filed as a bug report. Gnome 2.16 has been released as expected, with an announcement on the gnome-announce mailing list stating:”Today, the GNOME Project celebrates the release of GNOME 2.16, the latest version of the popular, multi-platform Free desktop environment.”Release notes are available on the official Gnome website. Gnome 2.18 is currently scheduled for the 14th of March 2007, with the first development version (2.17.1) due to be released on the 18th of October this year. Maintenance releases of Gnome 2.16 are expected in October, November and January. The first official stable release of the Exaile media player has been released today. The aim of Exaile is to mimic to functionality and usability of the extremely popular Amarok which is developed for KDE. However, Exaile is more suitable for users of the Gnome Desktop who prefer applications to match their desktop environment as it uses GTK+. Download: Source Tarball | Ubuntu Dapper PackageOfficial packages for other distributions are not yet available. The new release of GParted includes one of the most exciting features since the first release, according to the developers. As well as a number of bug fixes, GParted now contains full move support. This is a great achievement by the project developers and makes it a viable alternative to many commercial utilities. Also with this release are a number of new/updated translations. The progress feedback during operations has increased and the binary is now also about 15% smaller due to a code clean up. GParted along with the LiveCD/LiveUSB versions can be downloaded from the project page. At the time of writing, the Live versions have yet to be updated. The Xfce Development Team is pleased to announce the availability of the first release candidate of Xfce 4.4, their popular lightweight desktop environment. Included in this release are many bug fixes along with a few new features such as Trash support in Thunar and xfdesktop. According to the developers, overall memory usage has also been decreased.As usual, this release can be downloaded from the official project page. The changelog lists the vast number of alterations which have been made since the last beta release. 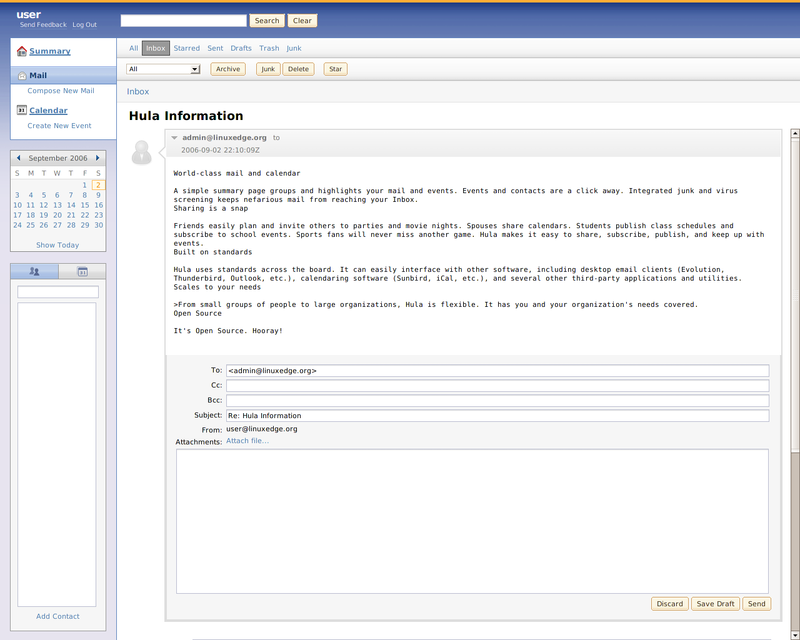 The Hula Project was launched on the 15th of February 2005 by Novell, with the goal of creating a mail and calendar server with the end-users in mind. This is where the application differs from other similar open-source projects and is the reason why I have been eagerly anticipating the first stable version of Hula. The project has not yet seen a single milestone version being released, however the project has not disappeared even though all surrounding the project has quietened. 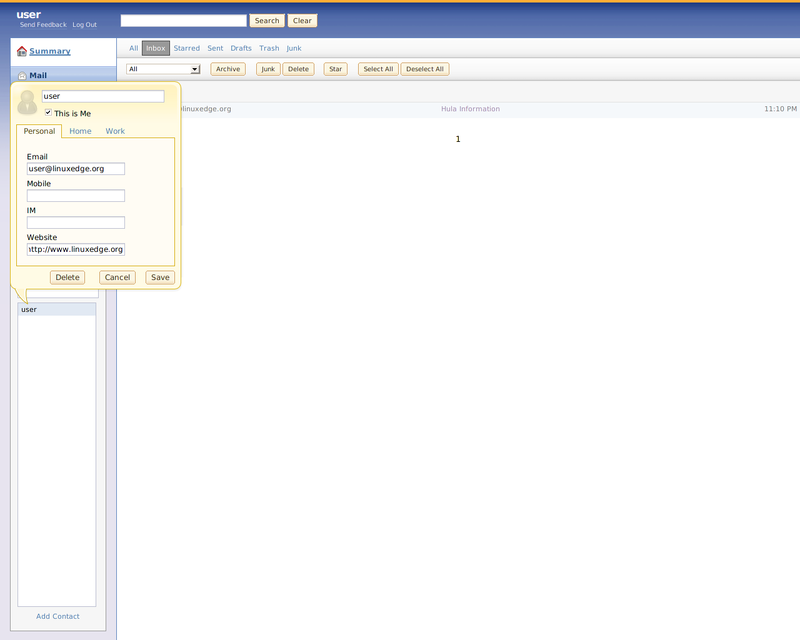 In fact, the user interface has recently been radically changed from the previous ‘Aurora’ UI to a new ‘Dragonfly’ UI. 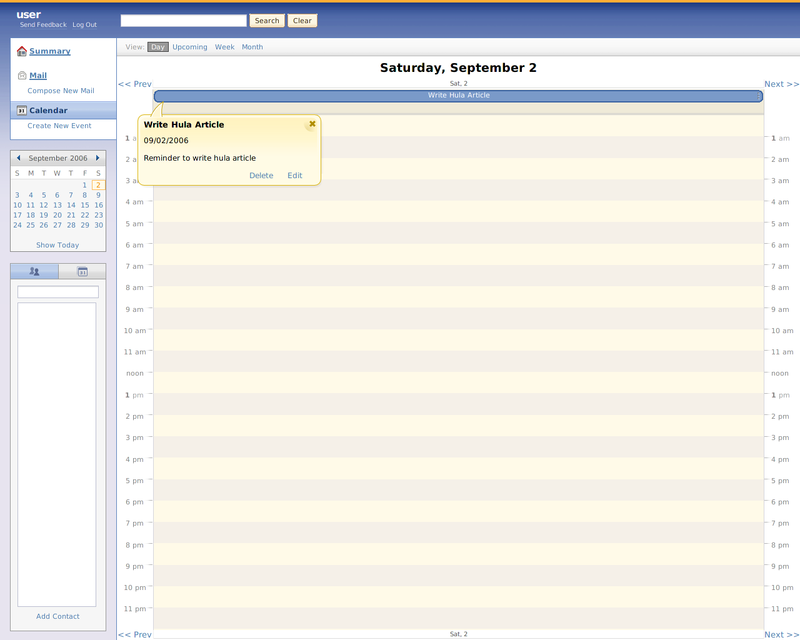 The Hula user interface uses a sidebar for easy access to either the mail or calendar functions of the application. 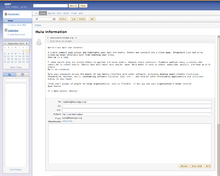 Composing new email is a little basic at the moment, mainly regarding the body of the message. I expect for there to be some form of a rich text editor in the future. 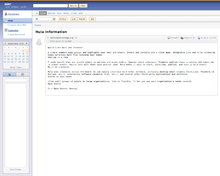 The Hula email display is similar to GMail in that it adopts a conversational style of emailing. 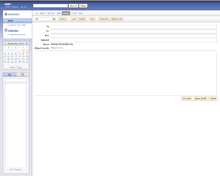 Hula’s web functionality mirrors GMail in many ways: the interface is clean, easy to use and the contacts on the sidebar vaguely resembles GMail. 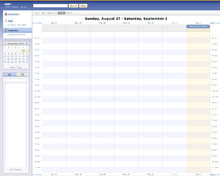 This is no coincidence: in the initial announcement, it was mentioned that the style of the mail and calendaring would be similar to that of GMail. The calendar functionality allows the use of different views: Day, Upcoming, Week and Month. Adding a calendar event is very easy and the process makes use of AJAX to make it quicker for the user to do. 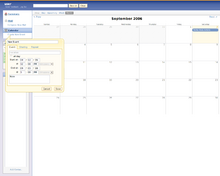 Overall the web interface is very fast, with almost instantaneous page loading. 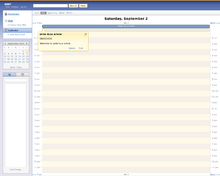 Users can make use of the contacts feature through the sidebar. There is some integration between the contacts list and mail composer, but this is not yet complete. Hula certainly is an exciting project, which I believe will add another strong application to the Linux server arena. It has taken quite a while since the initial announcement, but from what I have seen, the wait will be worth it. 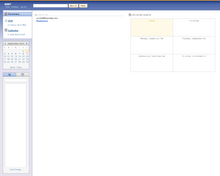 The web interface is already a pleasure to use, even though it is not complete. There are key features missing such as user preferences (present in ‘Aurora’) which are likely to appear in the near future. Also several page elements do not appear to be styled yet through CSS. In my opinion Hula will not only succeed – and likely dominate among the open source alternatives – because of the attitude which places the user first, but because it has been kick-started by Novell, distributor of the popular SUSE Linux distribution. 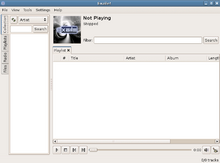 Novell has contributed significantly to the Linux desktop and gained popularity with projects such as XGL, Compiz and the new ‘Computer’ menu for Gnome. The releases of SUSE Linux Enterprise Desktop and Server have received excellent reviews. With their already present expertise in the Linux desktop and server market, they have the power to push Hula to clients and possibly bring people away from commercial alternatives (although this will by no means be easy with the likes of Microsoft Exchange around). It is in Novell’s interest that Hula succeeds, but not only for the open source community; it is already developing a product called ‘Maui’ which is based on Hula and will contain features geared to the enterprise market. It is currently in the beta testing stages. If Novell continues to develop Hula with their present attitude, I’m sure that both Hula and Maui will be very successful. 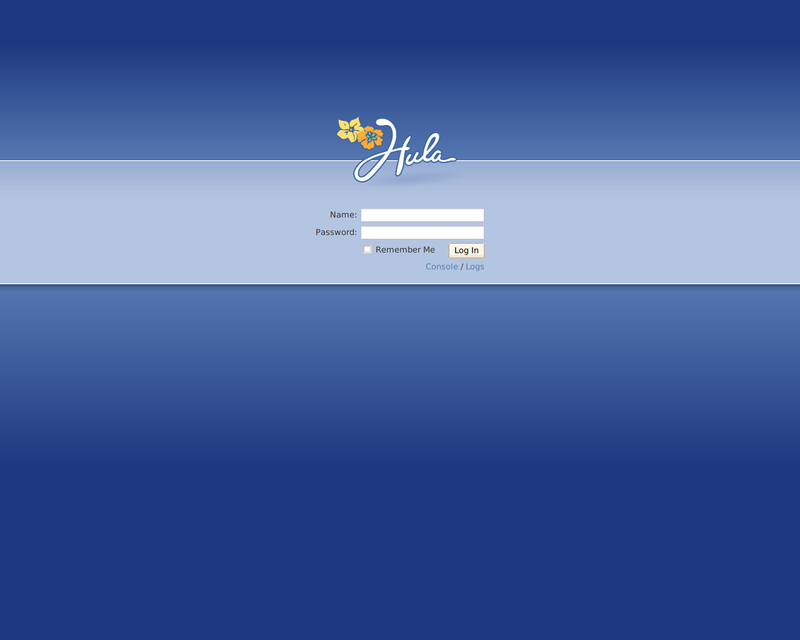 There is still much to come to Hula in the near future, such as a web interface to administer the server with greater ease (currently CMD utilities are used for administration) and backup tools. A final version of Hula (1.0) is currently being targeted for release at the end of the year. Remember: This is testing software, which is not designed for use in a production environment. Please do not set up a mail server using this software without being prepared for odd behaviour or other problems. I suggest that you at least wait for Hula 1.0 before deploying it on critical servers. For more details, check out the official Hula project website. Joe Shaw recently announced the release of Beagle 0.2.9 on the Gnome mailing list. This updated version is mainly a bug-fix release and includes fixes regarding performance degradation which some users may have experienced. Some DllImports have been fixed so that development packages are no longer required on some distributions. The full list of changes since the previous version can be viewed here along with the list of known issues. The Beagle 0.2.9 tarball can be download as usual from the wiki. The second alpha of Ubuntu 6.10 has been made available on mirrors. This update contains many of the latest packages including kernel 2.6.17, GNOME 2.16 RC1 (final release expected on 7th September), OpenOffice.org 2.0.3 and Firefox 2 Beta 1. According to the developers, improvements have been made to the system boot up times and the start time of the GNOME Desktop Environment along with improvements to the user interface. With the release of the new NVIDIA and ATI drivers, AIGLX compositing has been turned on by default. As this release is an alpha, it is obviously meant for testing rather than as a main OS. The final release of Ubuntu 6.10 is scheduled for sometime in October this year as indicated by the version number. More information on this release and screenshots can be found on the Ubuntu Wiki and the iso images for all supported architectures can be downloaded from mirrors. The Gentoo Release Engineering Team is pleased to announce the availability of Gentoo 2006.1, which is the second release of this year. This release is available for all supported architectures and is a great choice for those wanting to control every aspect of their operating system. 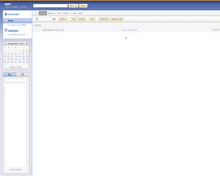 Gentoo 2006.1 can be downloaded from a number of mirrors using the bouncer system or via a torrent. For further details, the press release can be viewed from gentoo.org. Mozilla Firefox 2.0 Beta 2 has been released after a delay and is now available to download from the Mozilla FTP. 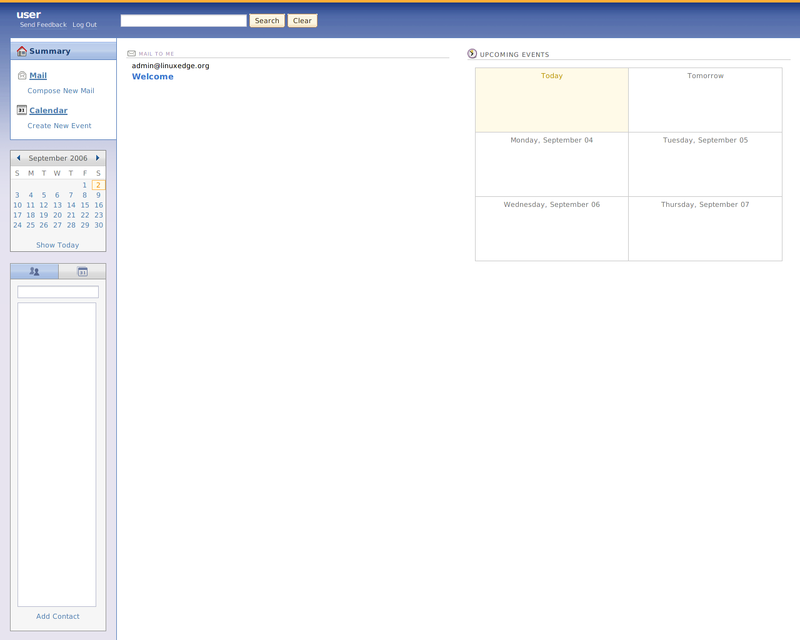 The beta features the long-awaited visual refresh which was conducted by Radiant Core. No official announcement has been made as of the time of writing. Linux Software News, Proudly powered by WordPress.